Blueberry Coffee Cake is one of my family’s favorite morning treats. 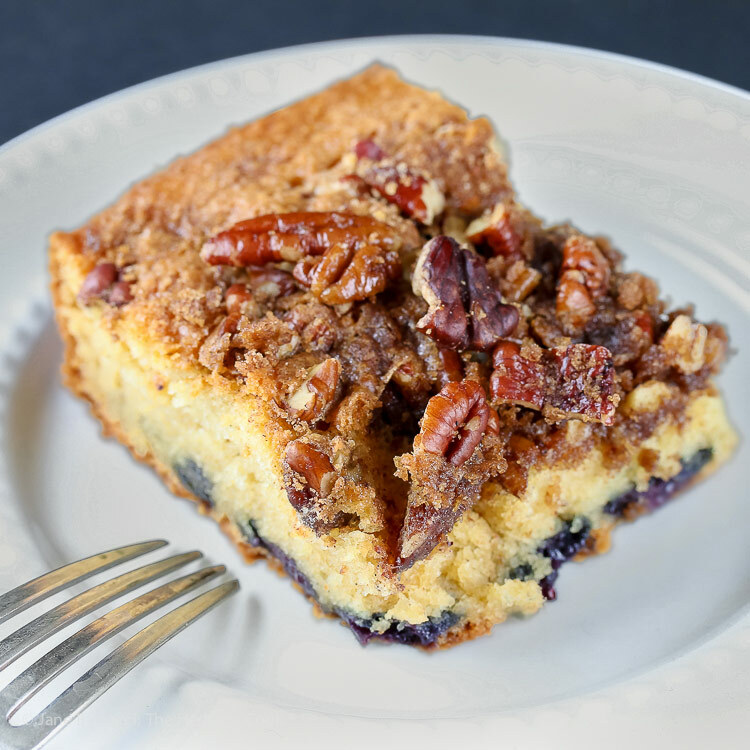 Rich and buttery cake with vanilla notes filled with slightly tart fresh blueberries, and finished with a cinnamon, nutmeg, and cardamom scented pecan/brown sugar topping, it is about as good as it gets. I love that I can whip this cake together with very little effort and pop it in the oven while I am working on the rest of breakfast. If we have guests visiting, they wake to the smell of freshly baked coffee cake – pure heaven! For this cake you can see that the blueberries sank to the bottom … I forgot to toss them in flour to keep them suspended in the batter. It only takes a minute but it really helps keep them more in the center of the cake. This helps a lot if you are making this gluten-free because the batter is softer, without the structure of the gluten to help with suspension. If you are only baking gluten-free occasionally, feel free to use a commercial blend such as Bob’s Red Mill 1-to-1 or Pamela’s. They are perfect for random projects. But if you find yourself baking regularly, you can save money by making your own blend. LINK I love being able to reach over, grab my bucket of flour, and make anything I want at the spur of the moment. This coffee cake can be made without the fruit or you can use golden raisins if you prefer. Try adding a little fresh lemon or orange zest, or other flavorings that you like. It is very flexible and easy to customize to your family’s favorite choices. Enjoy this Blueberry Coffee Cake this weekend and definitely put it on your list for holiday breakfasts when your house is full of family and friends. They will thank you! Preheat the oven to 350°F. Butter a 9x3-inch round cake pan, a 10-inch square, or 9x13-inch baking pan. If you will be removing the cake from the baking pan, line the pan with parchment paper with two sides hanging over the edges to use as a sling to lift the cake out of the pan. Rinse the blueberries and pat dry. Toss with a little extra gluten-free flour and set aside. Make the Topping: Combine the brown sugar, flour, and spices in a food processor and pulse a few times. Add the butter and process until mostly incorporated. Add the pecans and pulse until nuts are chopped. Alternately, you can do this by hand by cutting the butter into the seasoned brown sugar/flour mixture using a pastry cutter or two knives in a medium bowl. Make the Cake: Place the dry ingredients in a bowl and whisk to thoroughly combine. Set aside. Beat the butter in a stand mixer fitted with a paddle attachment until smooth. With the motor running, slowly add the sugar and beat on medium speed for 1 minute. Add the eggs and mix until the mixture comes together and is light and creamy, 2 to 3 minutes. Stop the machine and scrape the sides and bottom of the bowl (under the beater) to get any unincorporated bits mixed into the butter and eggs. Add the dry ingredients to the butter mixture, 1/3 at a time, alternating with dollops of sour cream. Scrape the sides and bottom of the bowl again and mix in any unincorporated ingredients. Add the vanilla and mix it in. Pour about 2/3 of the batter into the prepared pan and smooth into the corners. Top with the blueberries, then cover them with remaining batter. Sprinkle the topping evenly over the batter. Bake until the cake is raised and golden, about 30 minutes. Let cool at least 10 minutes in the pan before cutting. If transferring to a serving platter, cool to room temperature before carefully using the parchment to lift the cake from the pan.